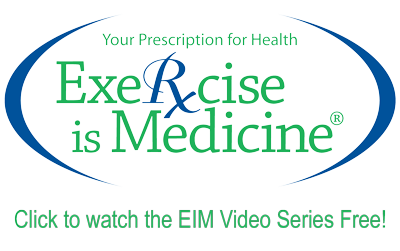 Exercise is Medicine® is an initiative focused on encouraging primary care physicians and other health care providers to include exercise when designing treatment plans for patients. Iverson Fitness, LLC, is an authorized provider of the Exercise is Medicine® campaign, specialists who can assist you in designing and implementing exercise plans for improved health and well-being. Exercise is Medicine® is committed to the belief that exercise and physical activity are integral to the prevention and treatment of chronic disease and should be regularly assessed as part of medical care. Along with the National Physical Activity Plan, Exercise is Medicine® strives to make physical activity a “vital sign” that is routinely assessed at every patient interaction with a health care provider. Exercise and physical activity are important to health and the prevention and treatment of many chronic diseases. More should be done to address physical activity and exercise in health care settings. Multi-organizational efforts to bring a greater focus on physical activity and exercise in health care settings are to be encouraged. I invite you to get involved with efforts in the Exercise is Medicine® campaign by promoting exercise, weight management and lifestyle intervention to individuals, family, and friends who may be suffering from chronic and often preventable diseases due to inactivity, obesity, and stress. As a team provider and prevention expert for the Exercise is Medicine® campaign, I am more than willing to assist anyone who needs help getting started on a program. Some insurance coverage may apply.